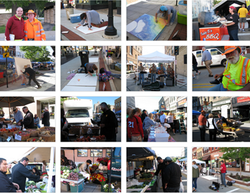 "To foster the commercial, social and community well-being existing in the Oshkosh area by providing a viable farmers market." The Oshkosh Saturday Farmers Market is an outlet for Wisconsin homegrown farm products such as vegetables, fruits, herbs, bakery products, meats, poultry, cheeses, eggs, cider, maple syrup, honey, plants, fresh and dried flowers, jams and jellies and other prepared food products. The Farmers Market provides an outlet for small producers of eligible products as well as for larger producers. Read about our 20+ year history in the Oshkosh Life magazine: "Growing for 20 Years, Farmers Market Celebrates a Milestone"
Our photos showcase the lively market, unique vendors, happy shoppers, and amazing atmosphere of the Oshkosh Saturday Farmers Market. Whether you are planning your first visit to the market or are familiar with it, these photos are a great taste of what the farmers market has to offer you, your family, and friends. 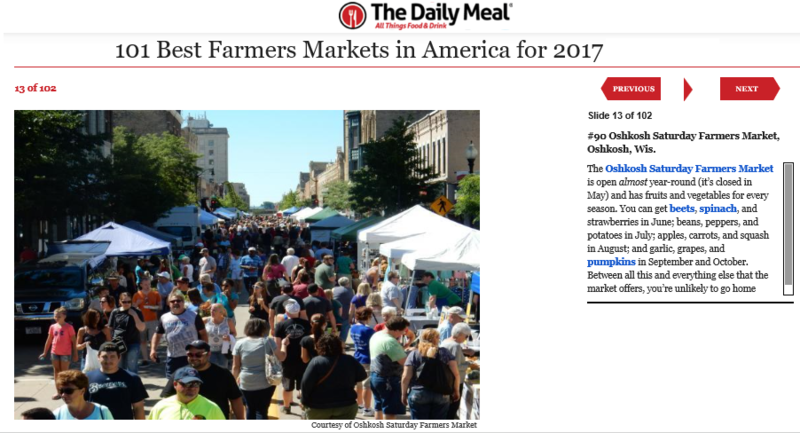 Visit The Daily Meal to read the article and view the slideshow that the Oshkosh Saturday Farmers Market is featured in!